API tokens are unique authentication credentials assigned to individual users. You need to create an API token to use the Fastly API. You can use API tokens to grant applications restricted access to your Fastly account and services. For example, an engineer user could limit a token to only have access to a single service, and restrict the scope to only allow that token to purge by URL. Every Fastly user can create up to 100 API tokens. 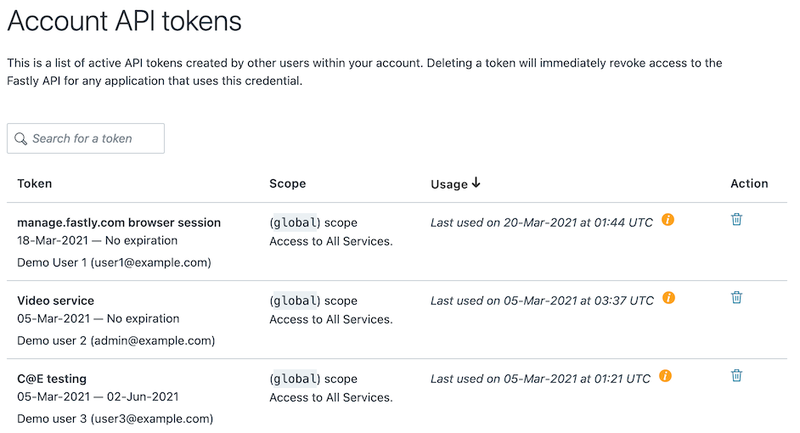 The API Token Management page allows you to create, view, and delete API tokens associated with your personal account. Superusers can view and delete any of the API tokens associated with the organization's Fastly account. TIP: You can also use the Fastly API to create and manage API tokens. Limiting an API token's service access and setting an expiration date restricts a credential's access, which can minimize the risk of damage if a credential is compromised. For more information, review the principle of least privilege. Click the Personal API tokens link. The Personal API Tokens page appears. Click the Create token button. The Create a Token page appears. In the Password field, type your account password. In the Name field, type a descriptive name for the API token that indicates how or where you will to use the token. 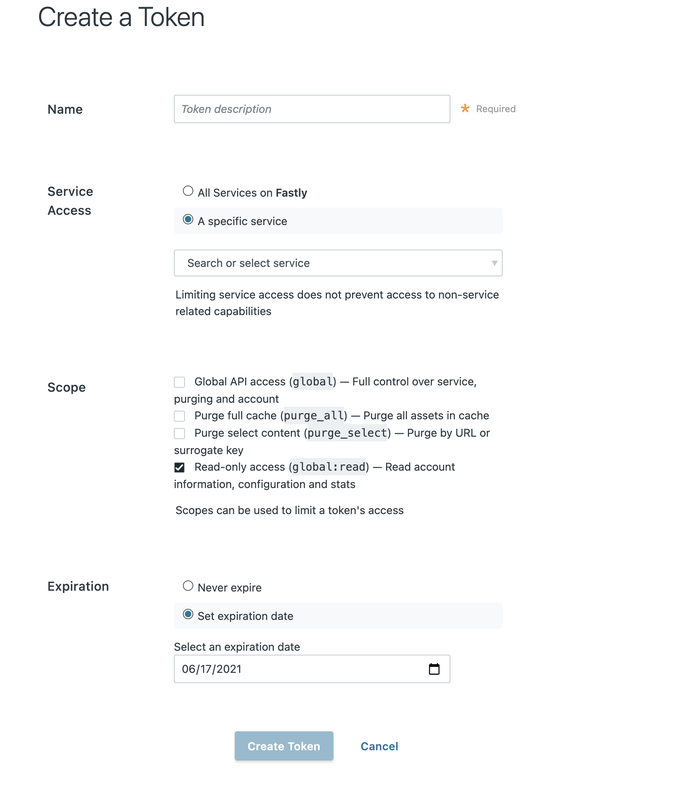 In the Apply to area, optionally select a service to restrict the service-level access of the token to one service. Global API access (global): Allows access to all endpoints, including purging. Purge select content (purge_select): Allows purging with surrogate-key and URL. Does not include the ability to purge all cache. Purge full cache (purge_all): Allows purging an entire service via purge_all API request. Read-only access (global:read): Allows read-only access to account information, configuration, and stats. In the Set a token expiration area, optionally set the API token to expire on a specified date. After a token expires, using it for any request will return an HTTP 401 response. Click the Create button to create the new API token. The string that comprises the token appears. This is the credential you'll use to authenticate via the Fastly API. Copy this string to a secure location — it will never be visible again. You may use the same token for multiple applications. You can view two types of API tokens for your account depending on your assigned role. Click the Personal API tokens link. The Personal API tokens page appears with a list of your personal tokens. Click Account API tokens. The Account API Tokens page appears with a list of tokens associated with your organization's Fastly account. WARNING: Deleting an API token will break any integration actively using that credential. Verify you have changed the API token for your integrations before proceeding. Find the API token you want to delete and click the trash icon. A warning message appears. Click the Delete button to permanently delete the API token. Click the Account API tokens. The Account API Tokens page appears with a list of tokens associated with your organization's Fastly account. If you created a Fastly account before May 15th, 2017, you may have used an API key (or multiple API keys) to authenticate API requests. This account-level credential was migrated to a personal API token with a global scope and access to all of your services. Because all tokens need to be owned by a user, this credential was assigned to a newly created, synthetic user with the name Global API Token.